Our Studio theatre is located at 227 Center Street in Hobart IN. We do smaller plays at this location, non-musical plays as well as small musicals. Shows that are just to small scale to put on the big Reinhart Auditorium in Merrillville. It gives us a chance to offer a wider variety of entertainment like our production of M*A*S*H. While it only seats 50-75 people, depending on the stage set up, it has many features of some bigger theatres. The stage can be adjusted from 20 feet wide to 40 feet. We have a full computerized lighting system with 12 source fours 10 Shakespeares, 10 Par 64's and 8 robotic lights. our light board is expandable to over 100 dimmers. 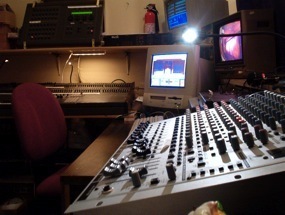 The theatre is equipped with a 32 channel sound board and 20 cordless mics. We can project on a 8 X 12 video screen with a 2400 lumen DLP video projector and we have the ability to ad fog, haze and even snow to a production.